St Andrews cat Hamish McHamish is often found in shops, hairdressers, restaurants and student flats in the town. 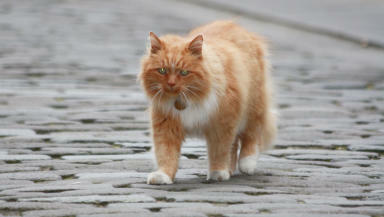 A book has been published about a Fife town's most famous resident, Hamish McHamish the cat. The fluffy ginger feline has roamed the streets of St Andrews for 13 years after he walked out on his owner Marianne Baird. Some of the feline's favourite haunts include Dynamic Hair and Pagan Osborne solicitors on South Street as well as the headquarters of the Association for International Cancer Research at Madras House. He also regularly features in the town's newsletter. Ms Baird said she catches up with Hamish once a year to ensure he has a check up at the vet but the rest of the time he survives on hand-outs from shopkeepers in the town and students. Tourists and students in the town stop to get their photo taken with him and share the images on the cat's Facebook page, which has almost 3000 likes. St Andrews resident and cat lover Susan McMullan was inspired to write a book about Hamish after moving to the town five years ago. The book, called Hamish McHamish, Cool Cat About Town tells the story of Hamish from when he was a kitten and features images of him around the town. She said: "I wrote this book because Hamish is a remarkable cat and deserves to be celebrated. The response I had while collecting Hamish's photographs was overwhelming. Everybody was tickled pick that he was to be honoured with his own book at last. "The sense of community that Hamish brings to St Andrews is undeniable. One glimpse at his Facebook page shows just how many people are brought together on a daily basis by the town's most famous feline resident." She added that almost everyone in the town has their own story about the cat. "Everybody has their own story about Hamish, like the time he casually took on a fully-grown Labrador and won, just because he felt like it, or the moment he walked across the stage at Madras College in the middle of school assembly. There's an unwritten rule in St Andrews, if Hamish appears at your door, always let him in," she said. Owner Ms Baird said: "According to folklore, no one can 'own' a cat. They may deign to keep you company, accept food and a warm place to sleep but, in the end, it's up to them who they choose to view as their rightful owner, if anyone at all."